Twenty-year-old Anna Marie was just fired for the third time--this time from a bakery. Why can't she hold a job? Well, for starters, she dresses . . . differently. She looks like a Goth girl to the extreme, her shock of white hair contrasting with her head-to-toe black garb, her face the only skin she chooses to reveal. But Anna Marie doesn't have a choice. Her skin, her touch, is a deadly weapon that must be concealed. She accidentally put her first boyfriend, Cody, in a coma when they kissed. Horrified, she ran away to Jackson, Mississippi, where she's been living alone in a cramped apartment and scraping by on food stamps. Then she meets otherworldly James and everything changes. He's just like her--completely alone and also on the run. To elude James's mysterious and dangerous family, the pair takes to the highway. As they cross the country, their simmering attraction intensifies and they both open up about their secretive pasts. 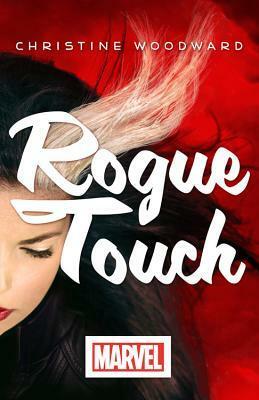 James reveals that his true name is Touch and he christens Anna Marie Rogue. But with danger at their heels, they know they can't run forever. Rogue must decide if she'll unleash her devastating powers once again, which she swore never to do, in order to save the only person who seems truly to understand and accept her. This is a new and different Rogue story. Yes, it starts out pretty much the same way that most X-Men stories do. Person with powers ostracized and driven on to society's fringes because of their power/otherness. That is until she meets James. James who wears a leather coat and whose teeth chatter at the height of a Mississippi summer. James of the glowing orbs of light that make ATMs spit money like slot machines stuck on jackpot. James who has stolen her heart. James who is not of this world? Getting know James as he gets to know Rogue, and she gets to know him is glorious. The romantic side of their complicated relationship developers very slowly. Granted the slowness is most likely due to their inability to touch without intervening layers, but oh well. Though this book is supposed to be Rogue's story. James or Touch and the mystery surrounding him, is the driving force behind this read. It seems that Rogue isn't the only one on the run. That's right folks...James is being hunted by people who travel in light and have orbs that make cars disintegrate. It is this chase that in time, starts to wear on one's nerves. While it is true that the chase both keeps the story moving and serves as a vehicle for important plot questions to be answered. It simply goes on far too long. Meanwhile, things with the already labrythine plot just seem to get twistier. This is an awesome read despite the chase drain and almost unbearable sexual tension between Rogue and Touch. A great thing about this story is that readers don't have to wait until the end of the book to encounter those "mouth wide open" moments. This is a book that screams to be a Summer blockbuster at theaters near you. It is this reviewer's sincerest hope that this is a first installment in a written series starring Rogue and Touch.